We hit the ground running today, beginning the last week of January at turbo speeds. Michel Martin headed to Capitol Hill shortly after today's program to record a conversation with a leading congressman that we hope to bring you tomorrow. Mondays are funny. Technically, we have the weekends "off." But, in this business, we're never really not working. We were BlackBerry'd to several developments this weekend -- the Democratic presidential primary in South Carolina, Caroline Kennedy's endorsement of Sen. Barack Obama (her uncle, Sen. Ted Kennedy, followed her lead this morning), the death of former Indonesian dictator Suharto and the latest developments in Kenya's post-election violence. And, President Bush will address the nation tonight in his final State of the Union briefing. There's much anticipation, as usual, on what matters will make the final cut in the hour-long (give or take, considering applause breaks) speech. It's probably safe to expect that a few issues -- economic stimulus, the Iraq war, and the usual recognition of select "ordinary" citizens with notable stories to tell -- will set the frame work for the speech. We plan to offer a recap of the President's address tomorrow. We're also keeping an eye on a situation happening about 500 miles to the west of us in Detroit. 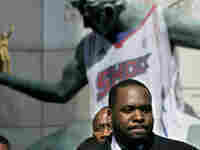 The city has been rocked by a scandal involving its mayor, Kwame Kilpatrick, who is serving his second-term. There are allegations that Kilpatrick and his chief of staff, Christine Beatty, perjured themselves on the stand last year during proceedings of a civil suit when asked about the dismissal of a high profile police official and ... allegations of a sexual relationship between Kilpatrick and Beatty. Just today, Beatty officially resigned from her post, so there's already one professional casualty. Opinions seem mixed on whether the mayor will survive the scandal. Folks are still waiting to hear from Kilpatrick, who's kept a low profile since the Detroit Free Press broke the story last week. In addition to our Barbershop talk, we've been thinking about how to further cover this story, if at all, in a valuable way that brings it out of Detroit -- it's a HUGE local story there. Certainly, there's been a long list of city hall scandals in this country. A quick web search on Antonio Villaraigosa (L.A.), Rudy Giuliani (New York), Marion Barry (D.C.), Bill Campbell (Atlanta) or John Norquist (Milwaukee) will take you behind closed doors of many of this nation's well known (and still, in some cases, well regarded) city leaders. But with a city in distress, a popular leader left fighting for his political career, and, perhaps most importantly, two families (Kilpatrick and Beatty both have young children) involuntarily thrust into tabloid headlines, it can be difficult for any of the parties involved to emerge as a winner if the allegations are true.